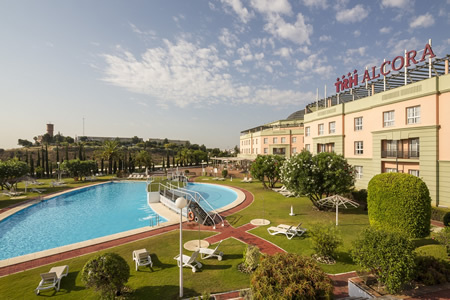 The Hotel TRH Alcora Business & Congress is located in Seville’s Aljarafe region on a natural viewpoint offering wonderful views of the marvelous city of Seville. According to the guide “Lonely Planet”, Seville has been named the best city in the world to visit in 2018. Its efficient connexion to Seville’s airport and its personalized attention for the organization of events and meetings make this hotel the perfect spot for combining rest, leisure and work. This hotel offers many high quality services, free Wi-Fi, its bedrooms surround its magnificent lobby; provided with natural light, terrace with pool, bar and solarium, outdoor parking that will make this hotel our touristic and work emplacement for our next Euromeeting. SATURDAY 19th. Check-in from 12.00h. Documentation delivery upon arrival. 20.00h. Euromeeting presentation. Welcoming cocktail and supper. Panoramic visit of Seville, the capital of Andalusia, located on the banks of the Guadalquivir River; the city, once a prosperous trading port with the Americas, has a rich Arab legacy. The Andalusian capital stands out for its joy and bustle in each of the streets and squares that make up its old town, which houses an interesting set of buildings declared World Heritage. Among the most remarkable monuments we can find the Cathedral de Santa María (Cathedral of Saint Mary of the See), the largest gothic construction in all of Christianity, the Giralda and the Neighborhood of Santa Cruz, with its typical narrow streets, as well as Triana and Macarena. All of this without forgetting the numerous terraces and bars where it is possible to practice one of the most deeply rooted and tasty habits of the city: the “tapeo” (bar-hopping). We will visit the Cathedral of Santa María, declared World Heritage Site. We will discover all the secrets and stories kept within its walls. Its construction began in 1401 where the old Great Mosque once stood; it was originally built in Almohade style, of which it conserves the Patio de los Naranjos (Orange-tree Patio) and the minaret, the well-known Giralda. This magnificent gothic temple is considered one of the largest Christian temples in the world. The greatness of its interior dimension is the very first thing that catches the attention of the visitor who comes through its doors for the first time; it has 5 naves and 25 chapels, which contain works of some of the most famous Spanish painters. Later we will head to the oldest inhabited palace in Europe and located within the monumental area declared World Heritage Site that is hidden in the center of Seville, we mean the Reales Alcázares, a fortified enclosure which became a royal residence in the 11th century. A polyphony made up by architecture that embraces all the senses in search of delight. This palace-fortress built by Abd Al Raman III is formed by rooms exquisitely adorned with plastering, tiled and coffered ceilings, which combine successfully with the splendid gardens and water, creating an unforgettable set. Notable inside the palace are the Patio de las Doncellas (Courtyard of the Maidens), with beautiful tile decorations, or the Patio de las Muñecas (Courtyard of the Dolls), which displays an interesting collection of capitals. Located on the meadow of Corbones River, Carmona is a city which stands out for its monumentality and for the imprint of the different cultures that have inhabited it throughout its long history. Churches, palaces and walls make up the important artistic heritage that houses its old town, dominated by the imposing image of its fortress of Arab origin, the Alcázar del Rey Don Pedro (King Pedro’s Alcázar). Its location, just a few kilometers from Seville, will allow the visitors to admire the huge monumental and artistic heritage. For this purpose, we will make a three-hour trip with our guides discovering the intricacies of this beautiful city. In our visit to the city worldwide known for its wines, Jerez has besides being called the Wine Cathedral, the richness of its artistic and cultural heritage among which we find vestiges from the Phoenician era, the strongly Romanized Ceret, the important Muslim Sherish and the later-and incredibly beautiful- Christian constructions. The importance of its wines has gained this city international recognition, however it also stands out for the singularity of its buildings; Jerez, land of the Carthusian horse, the fighting bull, cradle of Flamenco Art, city of important motor sport events and monumental center of artistic-historical interest. We will have the opportunity and will let ourselves be carried by the charm and magic of a fantastic equestrian show unique in the world. Later, we will visit the wine cellar “Tío Pepe” of González Byass, which will bring you back to the 19th Century. We will take the tour and have lunch with wine-tasting inside the wine cellar. Later we will take a sightseeing tour of Cádiz, we will take a stroll down its streets and squares and admire the city known as la tacita (little cup) (from Puerta Tierra, Cárcel Real, Caleta, Parque Genovés, Bahía Apodaca y Plaza de España we will walk to plaza Mina, San Antonio, Flores, the Cathedral and San Juan de Dios. The excursion programmed for this day will be carried out in the evening and we will take a short one-hour cruise tour during which we will discover the classic Seville in contrast to the modern one from a new perspective to continue admiring its beauty from the Guadalquivir river on an splendid boat, property of the company Cruceros Torre Del Oro. After the boat tour we will go to the Palacio Andaluz, where we will make an unforgettable tour through the history of Andalusian Flamenco thanks to its beautiful museum which offers a vision of art, dance and guitars, with their outfits and accessories which make up everything necessary for the development of this unique art; flamenco. Later on, during dinner by candlelight, we will enjoy a “tablao flamenco” show which will leave no one unmoved. Santiponce is a municipality of 8,000 inhabitants located 7 km away from the capital, in the metropolitan area of Seville. The current enclave is settled next to the Monastery of San Isidoro del Campo. It is known as “Sevilla la Vieja” (Ancient Seville) and houses the excellent Roman Ruins of Italica. Within its municipal area are the archeological sites of the ancient Roman town of Italica, founded by General Scipio in the 3rd Century BC. It became one of the most important cities in this territory at that time and saw the birth of two Roman emperors: Hadrian and Trajan. In this city two areas are clearly distinguished: the Vetus Urbs (old town), which is located at a lower level of Santiponce’s city centre and the Nova Urbs (new town); created by Hadrian as an enlargement of the already existing one. The open area to the public includes a part of the neighborhood built by Hadrian, a theater located in the old town and a modern park around the amphitheater, one of the largest of the Roman Empire, with a capacity of 25,000 spectators. Included entrance tickets for the Cathedral, the Seville Alcázar and Italica. Accommodation and full board with wine and water served at the table. From dinner on the 19th to breakfast on the 26th. PRICES: The trip prices have been calculated according to the currency exchange, fares, fuels, fees and VAT in force in Spain as of 01/08/17. Any change in the mentioned fee can be revised and passed on the customer according to the current legislation, and the general conditions included in this offer and attachments (Article 157 RDL 1/2007).